← Love Thy Neighbor As Thyself? 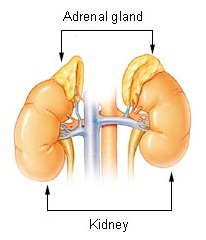 Our adrenal glands are endocrine glands that sit right on top of our kidneys. They produce hormones that aid our body in controlling blood sugar, burning protein and fat, and regulating blood pressure. They as well produce hormones in response to stress – playing a huge role in the flight or fight response. Two of the most important adrenal hormones are cortisol and aldosterone. If you are experiencing a handful of the above, you may have tired adrenals. Get a saliva test right away. Our adrenal glands are crucial to our immune function and as well support our thyroid in proper functioning. eat clean animal protein foods, organic root vegetables, and mung beans for easy-to-digest protein. Other tips: add lavender oil to your bath, avoid negative self talk as well as negative people, aim for a solid 8 hours of sleep every night, be sure to keep exercising (gentle movement, nothing strenuous), get at least an hour of fresh air daily. This entry was posted in About, fitness, life tips, massage and bodywork, meditation, nutrition tips, serendipity, Wellness, yoga and tagged adrenal fatigue, adrenal fatigue symptoms, adrenal glands, how to heal your adrenals. Bookmark the permalink.